Sales of new single-family homes fell 6.9 percent in January and are off 4.1 percent from a year ago. Sales are now about where they were in mid-2016. Total inventory of new single-family homes for sale fell 1.5 percent to 336,000 in January. Sales of new single-family homes fell 6.9 percent in January and are off 4.1 percent from a year ago. Sales came in at 607,000, down from 652,000 in December. Sales had posted two sizable gains in November and December 2018, after a period of weakness when they trended down from a cycle high of 712,000 in November 2017 to a recent low of 552,000 in October 2018. Sales are now about where they were in mid-2016 (see top chart). Across the four regions, sales in January plunged 28.6 percent to 50,000 in the Midwest, fell 15.1 percent to 342,000 in the South, and were down 11.4 percent to 31,000 in the Northeast. However, they did jump 27.8 percent in the West. From a year ago, sales are down 41.9 percent in the Midwest, 11.4 percent in the Northeast, and 3.2 percent in the West, but are up 6.2 percent in the South. Total inventory of new single-family homes for sale fell 1.5 percent to 336,000 in January (13.9 percent above January 2018), pushing the months' supply (inventory times 12 divided by the annual selling rate) to 6.6 months, up from 6.3 months in December. That is the second-largest figure since 2011 (see middle chart). 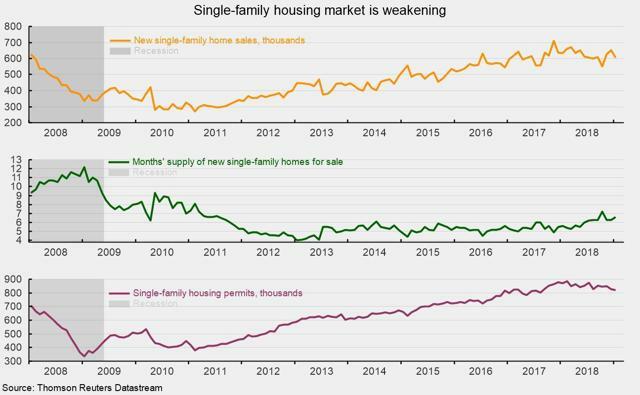 Declining affordability due to rising home prices and rising interest rates is likely to continue weighing on housing activity in the coming months. Sales are unlikely to move significantly higher, and new home construction is unlikely to contribute significantly to growth in gross domestic product in coming quarters. Still, the economy overall continues to be supported by a tight labor market, rising incomes, strong balance sheets, and reasonably high levels of consumer confidence. The main risks on the horizon are fallout from escalating trade wars and uncertainty about global economic conditions.